More than 2,000 former NFL players filed a lawsuit this morning in Philadelphia, accusing the league of concealing information linking football-related injuries to long-term brain damage. In the biggest sports lawsuit ever, the former players allege that the "NFL exacerbated the health risk by promoting the game's violence" and "deliberately and fraudulently" misled players about the link between concussions and long-term brain injuries. The NFL denies the claims, saying, "Any allegation that the NFL intentionally sought to mislead players has no merit. It stands in contrast to the league's many actions to better protect players and advance the science and medical understanding of the management and treatment of concussions." But with some of the sport's household names now revealing the human price paid for all those on-field heroics, this lawsuit could change football forever. Art Monk, Jim McMahon and Mark Rypien are among the players suing not only the NFL but the entire professional football culture. Attorneys say that even helmet maker Riddell has "a role in this." And former players say even NFL Films "glorifies football's violence." "We knew there was going to be a chance for injury," McMahon, who led the Chicago Bears to a 1985 Super Bowl victory, told ESPN. "We didn't know about the head trauma and they [the NFL] did. That's the whole reason for the lawsuit." "It's America's favorite sport and its favorite athletes and now we're hearing about the dark side," USA Today sports columnist Christine Brennan said. "It really hits like a ton of bricks." Kevin Turner, a running back for the Philadelphia Eagles until he retired in 1999, is one of the plaintiffs who can remember two documented concussions during his career. "I thought I just turned into a loser overnight and couldn't figure out what was wrong," he said on a conference call with reporters. He believes he suffered long-term brain damage from his years plunging into the line. Turner, 42, has been diagnosed with Lou Gehrig's disease. "I want to see the game of football prosper," he said. "It makes me proud to know the NFL is the No. 1 sport in America, but there's a safer way of doing it." Concussions have become football's No. 1 issue with several of the sport's biggest names suspected of killing themselves because of brain damage. Former San Diego Chargers linebacker Junior Seau was found dead in his home in May after an apparent suicide. Retirees Dave Duerson of the Chicago Bears and Ray Easterling of the Atlanta Falcons are also among the suicides that have raised questions about football's unbridled violence. Duerson, 50, shot himself last year in the chest and requested his brain be used for research. Easterling's wife, Mary Ann Easterling, described home life as "chaotic" and a "constant sea of change" as she said the former Falcon suffered from insomnia and depression. He killed himself in April. Mary Ann Easterling blamed her husband's dementia on "improperly managed" head injuries he'd suffered during his eight years in the NFL. It is estimated that two football players running full speed at 20 miles per hour can generate 1,800 pounds of force in a head-on collision. In an attempt to protect the players, the NFL formed the Head, Neck and Spine Committee in 2010. It replaced the Mild Traumatic Brain Injury Committee, formed in 1994, which today's lawsuit alleges generated false findings rather than actually studying the issue of concussions. 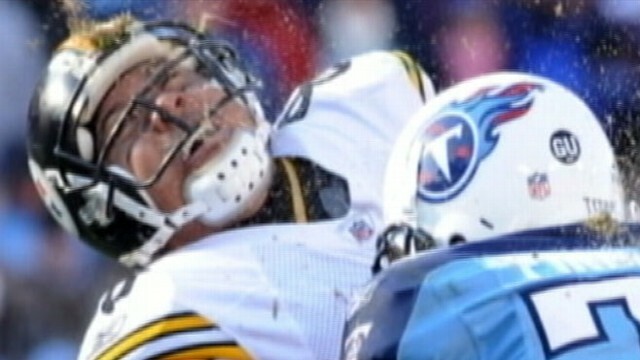 Commissioner Roger Goodell also instated new rules in 2010 to protect players from direct hits to the head. Stiffer penalties and suspensions have been handed out to players who break the rules. "Will our love of football really last," columnist Brennan said, "or will we be so horrified by the turn of events that we might find the nation gravitating away from the NFL?" Mary Ann Easterling said she wanted the families of football players to be more informed and the league take a bigger role in helping athletes. "What I want to see is that the information would be out there, more widely disseminated so families won't be in the dark about the symptoms they're seeing," she said. "I'd also like to see the NFL take care of the players that do have symptoms or could possibly have symptoms."